A common trope in Hollywood is when the good guys (or bad guys) draw a firearm on someone, they often rack the slide to chamber a round to ‘emphasize’ their intentions. Couple this with an (unfounded) fear that guns ‘go off’ on their own, and there’s a cultural attitude outside of the firearms world that is fearful of ‘one in the chamber’. Fears of one in the chamber are unfounded, especially with modern firearms. In the days of old, a firearm would occasionally discharge if it were dropped and a round was chambered, but these days, unless you are carrying a firearm made before say, 1960, it just doesn’t happen with a properly-working modern weapon. 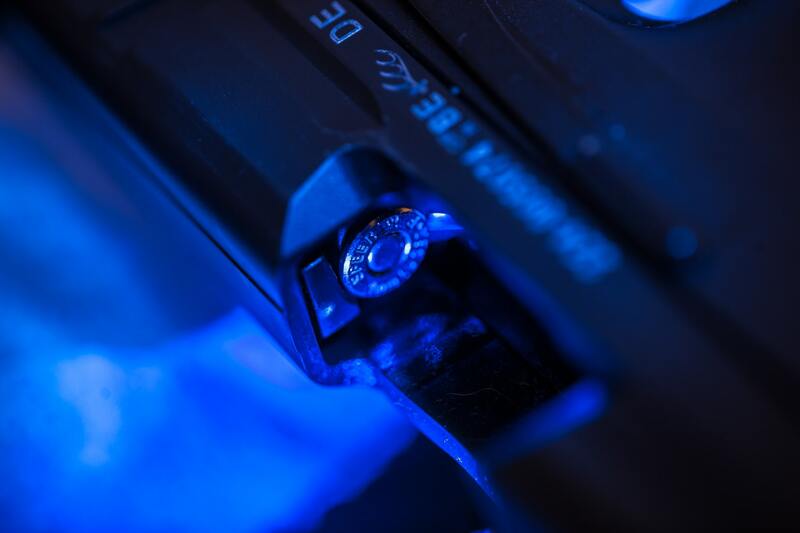 A simple mechanism called a drop safety ensures that the firing pin or striker cannot make contact with the primer of the cartridge, unless the trigger has been pressed. The answer is simple. Reaction time. When drawing your firearm, you want the fewest steps possible between the draw and having your gun pointed at the target. Having to stop and rack the slide on your pistol interrupts that process, and can slow you down by a few seconds or more. Racking the slide also requires a certain degree of fine motor control. During a stressful situation, the first thing to “leave” is your fine motor control skills. It also increases the chance of a malfunction, since the potential exists that you could perhaps not rack the slide fully, causing a round to not be loaded properly, and by the time you discover the malfunction, it may be too late. Under a stressful situation such as a defensive gun use, seconds truly count. Test it out. Either by using “finger guns” or an appropriate stand in like a water pistol or a “blue gun” (inert blue rubber/plastic dummy gun that’s the same shape and feel as a real gun), mimick drawing you firearm and doing a slide racking motion while a friend has the jump on you, i.e. he or she has his “gun” drawn and pointed at you already. This is a gross oversimplification of a real “DGU”, but the point will be delivered. Your friend is on target (you) and ready to fire, or has fired. Bang bang. Please don’t use a real firearm to try this out. We don’t need one more “gun idiot of the day” to feed the mass media. But is it legal to carry your firearm in this condition? In 99.9 percent of the use cases out there, yes, this is perfectly legal. I mention this, since (unbelievably), in Utah, you can open carry without a permit, but your firearm must not have one in the chamber. If you have your Utah (or a permit from a state which Utah recognizes as valid) permit, you can carry openly or concealed with one in the chamber. Thank you to handgunlaw.us for that interesting bit of information. However, for the rest of the country, if you can legally carry the firearm on your person, openly or concealed, you can carry with one in the chamber. Again, seconds count. When you draw your firearm for immediate defensive action, the last thing you want to worry about is racking the slide and risking a malfunction under stress. Those few extra seconds could be the difference between life and death.